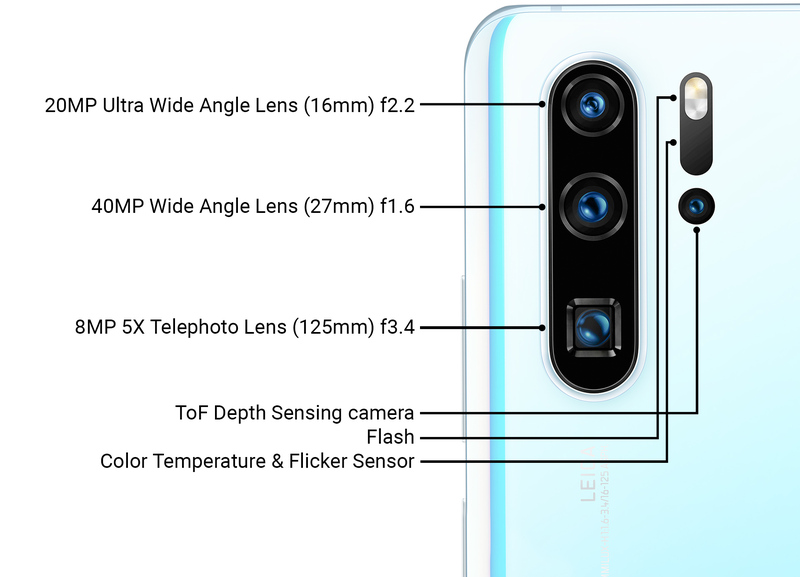 Here’s the camera assembly for the Huawei P30 Pro and… wait, what? Is that a square camera lens? The front design is pretty standard. There’s a notch. There’s no earpiece. Instead, you get a vibrating screen. Here’s a crazy case option: this is for scuba diving. On most high-end smartphones today, like the iPhone XS and Galaxy S10, you’ll only ever get a 2X optical zoom. Usually, these exist in an entire second sensor and lens on the back of the phone, giving you a choice between the standard 1x lens or extra 2x lens. The reason you usually don’t get large zoom multipliers in smartphones is because zoom lenses take space. Inside a zoom lens is a series of smaller lenses, some of which move inside the lens body to change the focal length. A larger distance between the lenses will get you a higher zoom multiplier, and on real cameras this can reach several feet long. But what if we didn’t have to stack all the components vertically? The trick to Huawei’s 5x optical zoom is that it uses a periscope design. From the outside, it looks like a normal camera setup, albeit with a funky square camera opening. Internally, though, the components make a 90-degree right turn after the lens cover, and the zoom lens components and CMOS sensor are arranged horizontally. Now instead of having to cram a bunch of lenses and the CMOS chip into 8mm of vertical phone space, we have acres of horizontal phone space to play with. We’ve seen prototypes of periscope cameras from Oppo, but as far as commercial devices go, the Huawei P30 Pro is the first. Huawei also made a big deal out of the new “RYYB” pixel layout in its camera sensor. Normally CMOS sensors are “RGGB,” one red pixel, two green, and one blue. By changing the green pixels to yellow, Huawei claims it can capture 40 percent more light, as the yellow filter captures green and red light. Of course, this will make the color wonky, but Huawei claims it can correct for that in software. The front uses a pretty standard notch design featuring a single 32MP camera in the middle of the screen. The display is a 6.47 inch OLED with curved sides and a 2340×1080 resolution. An optical fingerprint reader is embedded in the display, and you won’t find an earpiece anywhere, as that is embedded into the display, too. Huawei doesn’t explain the feature much other than to call it “Huawei Acoustic Display Technology,” but judging by the video the company put out, it seems like an electromagnet vibrates the screen to produce sound. If you want to dive into the Huawei P30 Pro, it’s out today and starts at €999 ($1,125).